A supersport with a chassis and technology of unprecedented sophistication. Since its first appearance, it has emerged as the new technological benchmark in the category, growing to 800 cc to create a new segment in the international supersport market. 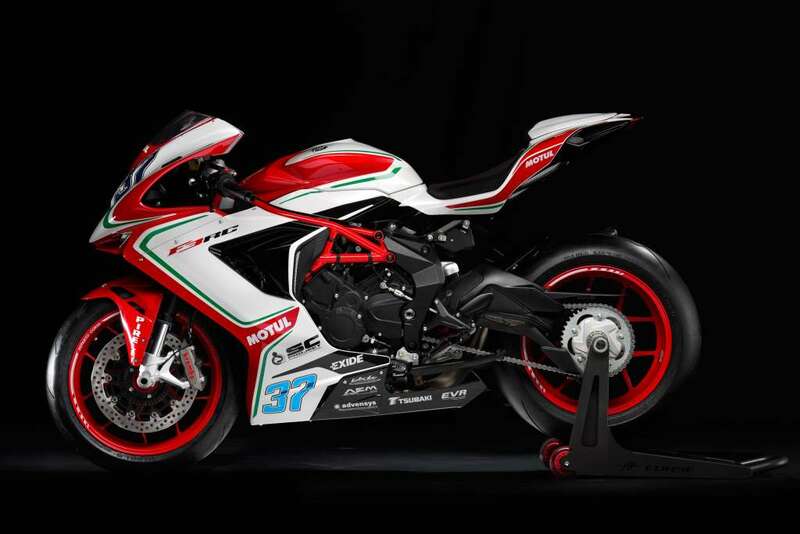 At the same time, its racing life has been packed with success, notching up more international victories to continue the MV Agusta’s enviable sporting record. 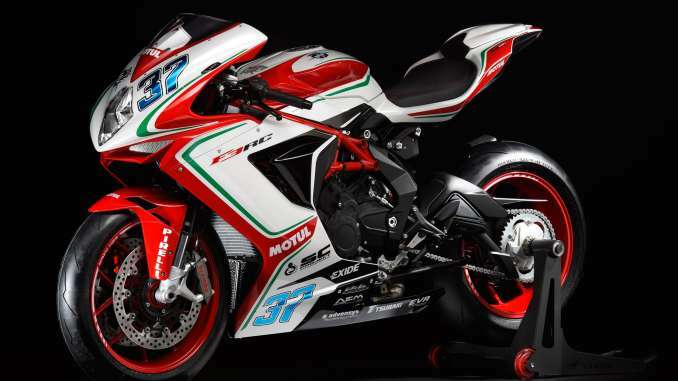 This achievement has been backed by a sound team that achieved improved results and image: the Reparto Corse Cluzel and Zanetti set the fans on fire with their sharp F3 RC Tricolori, certainly the most admired and envied motorbikes in the championship. Anyone who gets their hands on a F3 RC special series bike will be able to translate these thrills to roads and track days. 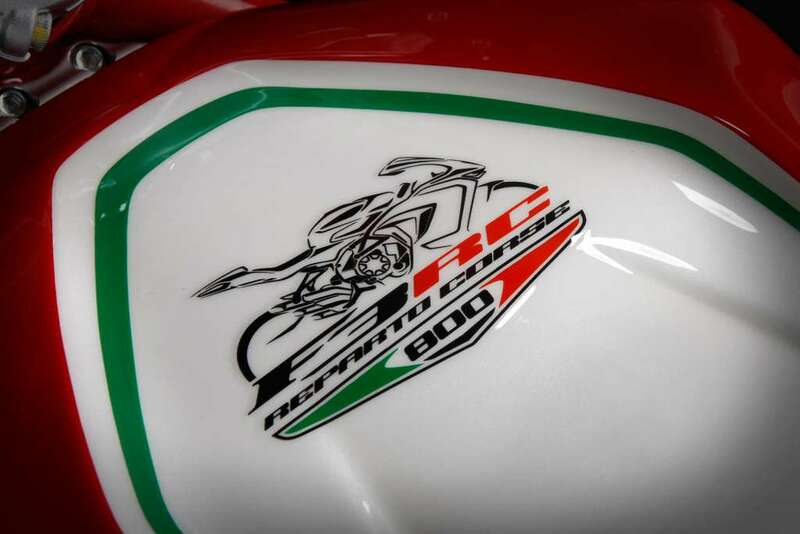 The F3 RC, produced in a limited edition of 100 bikes in the 675 configuration and 250 in the meatier 800 configuration. The new F3 800 RC is produced in a limited edition of 250 numbered and certified bikes. 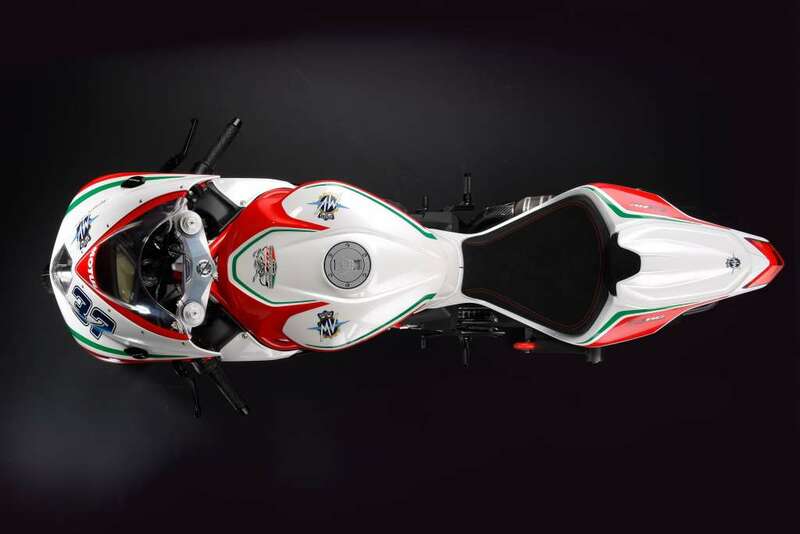 Throughout MV Agusta’s history, racing bikes and production models have always been closely entwined. A fact highlighted by extraordinary successes, such as the outstanding results achieved by the Italian manufacturer in recent years in the World Superbike and Supersport championships. Ever since the F3 was first conceived, engineers, designers and the racing department have worked as a compact team: the chassis, engine and electronics have been developed with the dual goal of winning on track and bringing the unique thrills of a race bike to the road. 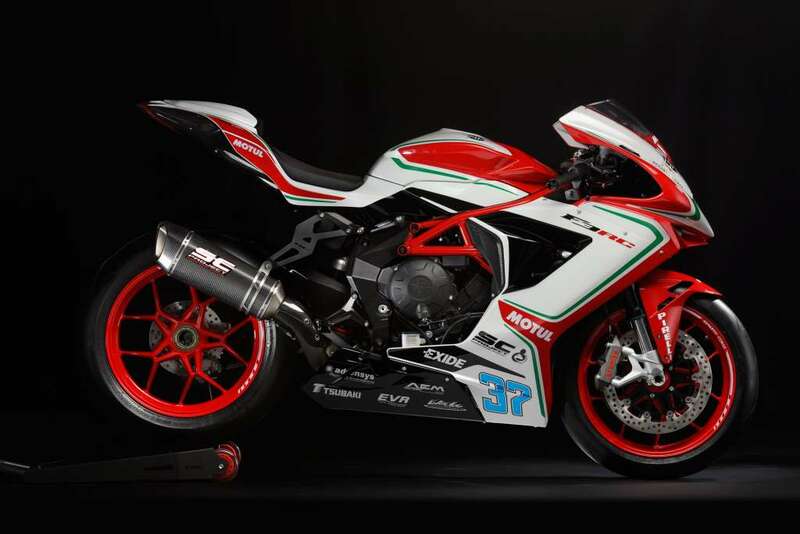 With the RC range, MV Agusta once again highlights its aptitude for racing: the F3 675 RC and F3 800 RC have much in common with the bikes seen at national and international race events yet are also exhilarating road bikes. Further development has made the 2018 models Euro 4 compliant. A variety of updates have been implemented to comply with the new standard, which requires a 50% cut in emissions and 48% less noise compared to Euro 3. On the styling front, new colours and graphics mirror those seen on the actual race bikes. With their red wheels – a direct Supersport offshoot – the 2018 F3 RC bikes are unmistakeable. Despite the switch to Euro 4, the most striking parameter remains maximum power. The F3 675 RC touches 128 hp (94kW) at 14,500 rpm with 71 Nm (7.24 kgm) of torque at 10,900 rpm; the F3 800 reaches 148 hp (108kW) at 13,000 rpm with 88 Nm (8.97 kgm) of torque at 10,600 rpm. Some of the most significant technical redesigns on the 2018 models concern the balance shaft, the primary gearing, the intake cam profiles and the valves. The gearbox has undergone a complete overhaul to make shifting easier and reduce clutch lever effort. Exhaust manifolds have also been redesigned, while the F3 RC silencer – supplied by SC Project – derives directly from the unit used by the Racing Department. As on the F3 675 and F3 800, the RC models introduce new engine covers. These enhance engine protection in the event of a collision or fall and reduce mechanical noise emissions. 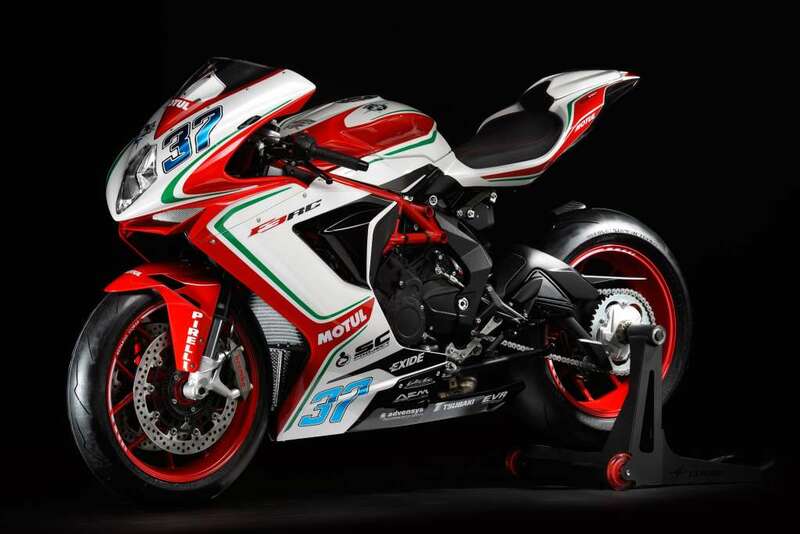 All without compromising that distinctive MV Agusta sound. The F3 675 RC and 800 RC control platform, developed extensively through racing, is based on the MVICS (Motor & Vehicle Integrated Control System). Key developments on the 2018 models include improved Ride By Wire performance, now with personalised mappings. Parameters on the 8-level traction control have also been fully revised to enhance effectiveness and fluidity. Moreover, the EAS 2.0 electronic shifter has been optimised for smoother shifting. A new frame mount point for the three-cylinder engine ensures increased overall rigidity, improving the already exceptional dynamic characteristics of the bike. The tubular steel trellis frame, closed off with aluminium alloy plates, is designed to offer maximum handling performance, as is evident from the wheelbase of just 1,380 mm, despite the long 576.5 mm single-sided swingarm. Each of the 350 limited edition F3 RC bikes comes with a top-drawer kit that boosts bike performance even further, effectively making it identical to the race version in terms of equipment and appearance. In just a few simple steps, the kit can be used to transform the F3 RC road bike into a perfect track day machine. The titanium exhaust system, with carbon fiber silencer, is supplied by SC Project and comes complete with carbon fibre heel guard and aluminium silencer support brackets. Also included in the kit is the electronic control unit with a dedicated mapping to maximise the increase in performance (133 hp at 14,570 rpm on the F3 675 RC and 153 Hp at 13,250 rpm on the F3 800 RC). The rear seat cowl (for singleseat use) adds a touch of eye-catching style, as do the machined from billet brake and clutch levers. The included rear sprocket is for race track gearing, while the rear stand and bike cover are for maintenance purposes. As proof of its uniqueness, each RC comes with its own certificate of origin. Offered in two displacements, the F3 RC is the essence of racing. The perfect balance of technology and design, in a very limited production run, consisting of 350 works of art. The incredibly lightweight and compact three-cylinder engine has been further refined and optimized to achieve maximum performance obtaining peak power and torque for both track and road use. F3 675 RC produces 128 hp (94.2 kW) at 14400 rpm and 71 Nm (7.24 kgm) of peak torque at 10900 rpm; The F3 800 reaches even further extremes, producing 148 hp (108.8 kW) at 13000 rpm and 88 Nm (8.97 kgm) of peak torque at 10600 rpm. Max. power – r.p.m. (at the crankshaft)** 108.8 kW (148 hp) at 13.000 r.p.m.